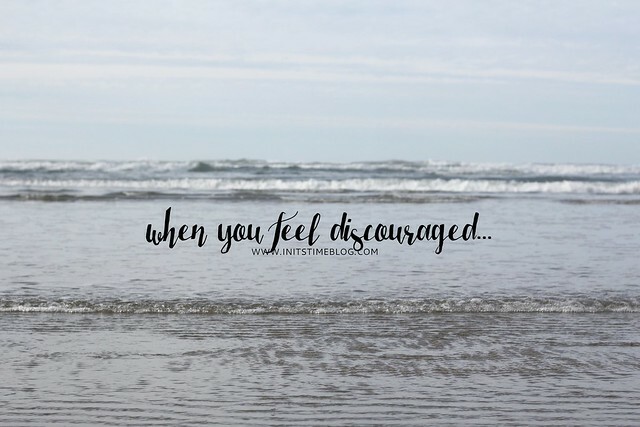 When you feel discouraged, what do you do? Who do you turn to? What do you look for for comfort and rescue? Let's just say that those were not my finest moments. I'm by no means proud of those moments, but they happened and it was because of them that I changed, and grew, and believed in Him even more. I was reading through SheReadsTruth and read through Luke 12, where Jesus reminds His people that they are of great value to Him and that He knows the number of hairs on our heads, knows what we need when we need it, and are of more value than the sparrows He created. And that's when I realized that it doesn't matter what people say or don't say. It doesn't matter what people do or don't do. It's all about Him. That's where my value lies. That's where true love is. And that's where I can rest. So note to (future) self: when you're weary and discouraged, tired and worn, turn to Him. Thanks for your honesty, Kiki!!! I'm so glad that you've made it out of that with fresh eyes. The challenges may continue, but reality checks make such a difference! I'm not there now, but I have been there! I know how easy it is to get there...Praying for you, girl! Love this :) it's easy to forget but so important to remember. that's such a beautiful message. I've been feeling discouraged as well, and it took me going to a training last Sunday to be reminded of why I need to turn my life around. God really does make things happen on His own time, when He knows we need it the most. AMen. Keep your eyes on the Savior.. I love Psalm 103. Agreed! There are days when I'll read His Word and just read it to read it, and other days I open it up and KNOW that passage was read for a purpose. :) We definitely need to make sure we get our Jesus dosages! Agreed. SO easy for me to forget and something I need to remind myself of daily! Thanks, Andrea! God's timing is something that I'm continually learning and reminding myself of. It really is all in HIS timing and in HIS plans, no matter how much I yearn and want control over it all. But like you said, He knows what we need and when we need it most! :) Praying for you! I am recently learning that remaining with the Lord makes the times of discouragement fewer and farther between. "it doesn't matter what people do or don't do...it's all about him" yes yes yes it is!